Around August 15, there is a holiday called Obon (お盆) in Japan. Obon has roots in Buddhism and other aspects of Japanese culture. We believe that our ancestors are coming back to the world of the living from the world of the dead for several days in August. However, for many Japanese people, including me, it is more like a traditional event than a religious ritual. Although I don’t call myself a Buddhist, I still enjoy doing some of the stuff. 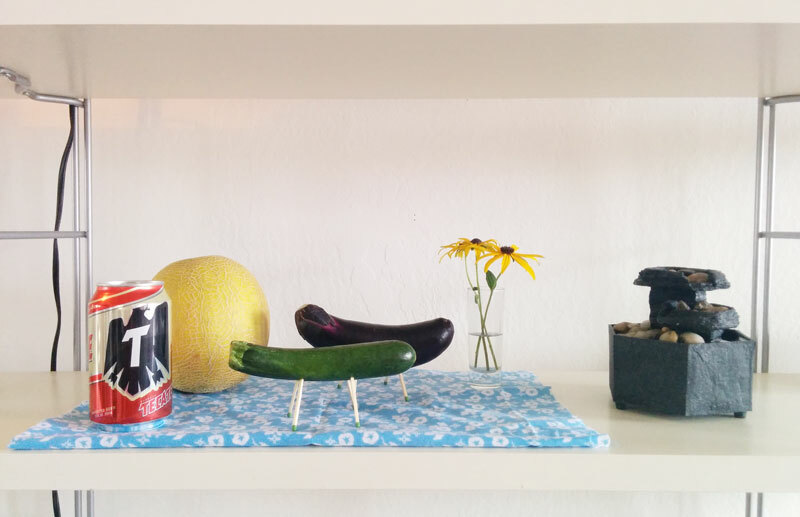 The picture above is a zucchini horse and an eggplant cow that are simply made with vegetables and matchsticks. The horse is for ancestors to come to our world quickly and the cow is for going back to their world slowly, so we can spend as much time together as possible. The cow is also convenient for bringing some souvenirs back with them. At my home, they can get a melon, flowers, and a Mexican beer. The horse is supposed to be made with a cucumber, but I am in California now and could get a zucchini more easily when I made it. I think that it is good to have a moment to thank our ancestors and other dead people. That helps me think about what I should do with my life while I am here. The highlight of Obon is Bon Odori (盆踊り), a folk dance that welcomes the spirits of the dead. If you visit Japan during summer, you can easily find Bon Odori festivals on weekends all over the country!